Recent attacks on Gordon Brown by George Osborne and William Hague have so far failed to seriously undermine voter affection for the Chancellor. An ICM poll for the News of the World gives Mr Brown a 12% advantage over David Cameron when it comes to "likely to make a good prime minister". 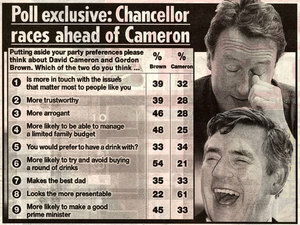 The Chancellor is also seen as more in touch, more trustworthy, more likely to manage a family budget and the best dad. On the credit side for the Tory leader - David Cameron is not seen as being as arrogrant as Mr Brown, slightly better drinking company, less likely to avoiding buying a round of drinks and much more presentable. This poll (1PM ADDITION: the sample for which appears somewhat slanted towards Labour supporters according to a post on PoliticalBetting.com) and other recent surveys underline the mountain that the Conservative leadership still has to climb. After the euphoria of Mr Cameron's first couple of months the durability of Gordon Brown's popularity will alarm some of the Notting Hill set (who are under fire in today's newspapers). Mr Cameron returns from two weeks of paternity leave on Tuesday and is billed to give a speech in which he will reaffirm his commitment to change the Conservative party. This will disturb some on the right who also want to know that the Tory leader is still faithful to core conservative themes. It's interesting that Cameron seems to score best on the most superficial measures (e.g. looks nicest, more fun to have a drink with). This dovetails quite well with recent polling that found people thought "Cameron's Conservatives" were shallow. GB may want to call an election quickly after becoming leader, this will push Cameron into a massive problem with his strategy. What hasn't he shown them? I hadn’t realised that I live in such a bubble. Some people around me are uncomfortable with Cameron – but everyone is fed up of Gordon Brown. The big challenge for David Cameron is to show that he isn't a lightweight. The Brownites are determined to present the next election as Substance Versus Spin - Experience Versus Inexperience - and they are going to use the economy and national security above all other issues. It is hard for an opposition politician to demonstrate substance but DC needs to take some big decisions on issues like energy, national security and pensions to show that he is willing to face up to the nation's long-term problems. The danger - at present - is that some of our decisions can look like they are more in the interest of popularity, rather than the best interests of Britain. Brown's popularity may, of course, suffer if the economy weakens but that won't help the Tories if he is still seen as best-placed to put the economy back on track. We will climb that mountain, by jove we will. By the left quick march,left left left.Is that the Labour Party Hezza? Don't be daft man this is the New Model Tory Party, left left, keep in step there, left left left. A diverting poll - pretty meaningless as they don't publish the question they must have asked "which party would you vote for?". Also party differences are noticeable - same proportion of Tory voters rate Cameron as Labour voters rate Brown, with Brown leading in LDs & not prepared to say/others. So NOW poll is fun but as James so helpfully states it shows phase 1 (become a nice party) is going well but phase 2 (get Brown) and Stage 3 (get some atractive conservative policies) still need some application. BTW did anyone hear Brian Walden on political luck this morning on Radio 4? There's an "it'll all be over by Christmas" mood, whereas they need to settle down for a very long conflict. After all, only last year the Conservative Party was well-beaten in a general election...Tory support has been at such a low ebb for so long, one would expect them to need two general elections to gain a majority....What should David Cameron do? Well he should pray for good luck and opportunistically seize it if it turns up. He needs to emulate Disraeli .... a deaf ear to the Old Guard who wanted ... a return to the good old days. Democratic electorates very rarely want to go back. The present British electorate appears to have a particular dislike of anything old-fashioned and to enjoy novelty. Perhaps the voters shouldn't be like that, but many of them are. Do you want their votes or don't you? That will be the unspoken question Mr Cameron will put to his party." Brian Walden is right in many respects, however what me must not forget is that when people vote they vote thinking about their mortgages, their jobs, their parents pensions (or their own), healthcare and schooling. I have to say if I sat in a ballot box with these things on my mind I would think: Brown has kept the economy growing for 12 years, he hasn't raised taxes too much and I have seen investment in local schools and hospitals. In Cameron they see a good-looking, well presented bloke with no real experience to speak of. Does anyone on here, without resorting to quoting the vague party mantra, believe this is an election winning comparison for Brown? In the end this is how the Labour party will portray it in 2009/10. If Brown is so popular, why then did he help to contrive to lose an 11,000 majority in Dunfermline and West Fife? I don't think the Chancellor is as popular as some of the pollsters say he is - I suspect the fact that nearly everyone thinks he will be our next Prime Minister contributes somewhat to his "will make a good Prime Minister" ratings. Unweighted poll - can be safely ignored. Asked how they voted at the last election, the respondents answered LAB 50.1%, CON 31.5%, LD 17.2%. Thoroughly unfair poll therefore, and a bad piece of journalism. Dont be too concerend abpuit this 'Poll', its so blatantly rigged, and its common knowledge thatt he Labour regime have the 'pollsters' in their pockets, they produce whatt hey are told when they are told. Steve - your remark is close to being actionable. Please note this site's comments policy. This poll has to be set alongside other polls which show that David Cameron has made progress but that it is modest compared to what is required for a majority of one. This poll matters because - sampling issues aside - it shows Brown's strengths relative to those of DC (and that they are being championed by the News of the World). It is in these strengths that Labour will try to defeat us. We need to neutralise those disadvantages. I agree we have much more to do - winning power in a single election is going to be very difficult but, with respect, the sampling error in this poll makes the NOW conclusions blatantly wrong. ICM were quick to bring out the data, which makes me suppose they aren't entirely comfortable with the presentation. For example NOW says on that on "Trustworthy" Gordon has a 39% to 28% lead, weighting it as Politicalbetting says should be done (by past voting weighted against outturn) shows a very different Gordon at 33% and Cameron at 35.5% - a DC lead. Concerned that by heading this thread "Brown's popularity" you are accepting blatant Murdoch press spinning. The actual results don't support the spin and properly weighted show Gordon is much weaker than it tries to show. A more interesting story is why we are seeing "Senior MP unrest", blatant spinning of poll results in Telegraph, Sun and NOW, "Notting Hill set" stories. I hope at CCO the data is being properly analysed to understand that however lightweight the questions what the real picture is as regards DC's position vis a vis Gordn and where we need to beef up our strategies. Ed, I have to agree with Ted on this. The sample was unwighted and had too many Labour supporters. ICM should be challenged on this. It would be interesting to know what the relevant British Polling Council rules state about using unweighted samples. It would be instructive to know of the politocall allegiances of the NoW's editor and the author of this misleading piece. Thanks to those who have commented on the imbalance of the ICM poll. I now have inserted a reference (in green) to the PoliticalBetting.com post. I still think all of my conclusions on the modest (but welcome) nature of David Cameron's opinion poll advance still stand. And, to repeat myself, the ICM/ NotW survey also gives us insight into the relative strengths of Brown and Blair even if the numbers are slightly skewed towards Gordon Brown. Stepping back from the crude numbers, and doubts over methodology, what does this poll tell us? We're doing better under Cameron than we were before, but not well enough to regard the election as anything like won, and Brown remains a formidable opponent who is busily framing the debate in his favour. So, no change there. Strategic dilemma remains as is. I wonder if these issues have been discussed already? I wonder whaat the new proposals to inflict pension chaos onto Brown's payroll vote will do to his chances of becoming PM? Could turn quite nasty! All new entrants- no final salary pension??? OOPS!!! I cant wait for the reactions. The bad practice in this poll is dangerous - I noticed it quoted in passing on Teletext, lazy / enemy journalists accept the premise that Brown is more popular (which NOW wanted to present as the truth) rather than recognise what a rubbish poll it was. Like Populus being embarrased by the Times's poll on Davis's lead (on an unrepresentative sample) I think ICM are embarrassed by this one. Think its something the trade body should look into. If Brown is as popular as these polls suggest then we need to attack him day in day out for the failure he as been. He as not built an econonomy on firm foundations, he as built an economy on massive government spending and consumer credit. If he was a builder Mr Brown would probably build his houses on foundations of sand. The man is a fraud and its up to the Conservative party to expose him as such. When are you going to start putting the letter H in the word (h)as Jack? The weighting seems odd, however all pollsters know that people who are asked to recall how they voted often get it wrong - and tend to be biased towards the winner. The poll can't just be dismissed out of hand. However, what matters is the straight voting intention question. Polls that don't include that aren't particularly interesting. IIRC there is a study in the US where people are polled after presidential elections to see how they voted - the winner regularly wins this poll by far more than the actual election. While I agree about voters recall, what stands out in this polls data when you look at detail is the difference in the answers between 'Conservative" & 'Labour" respondents which seems to bear out the recall (or intention?). All pollsters recognise the inherent pro-Labour bias in telephone pooling, and ICM in particular has tried to correct this (not very well often). While pollsters can't be responsible for the editorial ine taken, they can be responsible statisticians. Yet more evidence of a deal between Murdoch and Brown. And more eveidence that Murdoch will not back Cameron until he declares open support for the EU. That probably means there is a nice deal between Brown and the EU, who have asked Murdoch to provide succour accordingly. Murdoch as we know from Lance Price fears EU power. Only they can remove his media privileges. My guess is that Gordon's offered the Euro. Only he can declare that our economies have magically converged (as soon as he's PM).